This account of 45 Royal Marine Commando, concentrates on the amphibious landings on the beaches of Normandy and the immediate aftermath. Front lines were often unclear and transient, as troops on both sides moved around the contested area. This is graphically illustrated in the detailed descriptions of the many actions 45 Commando was involved in. But first, the amphibious phase of Operation Overlord, codenamed Operation Neptune. Since the beginning of the war, the Royal Marines had been fighting on land and at sea. However, one formation of the Corps, the Royal Marines Division, had been specifically organised for land warfare but had never been in action. The RM Division was broken up and formed into two Commando units, together with two Commando groups from the Army. The four, together, made up the Special Service Group. In August 1943, 45 Commando Royal Marines, was formed. They were ideally suited for the Commandos, because of their own rigorous training, which, for the most part, fulfilled the high standard required. After the British Expeditionary Force's withdrawal from Dunkirk in early June,1940, Major General, Robert Laycock was charged with raising and training units for special operations, which included raids on the Lofoten Islands, Vaagso, Dieppe, Boulogne, St Nazaire and countless others. The term ‘Commando’ was first coined by Laycock for troops trained for special duties of a hazardous nature. From lessons learned on operations, a training programme evolved, which produced a fit, highly trained band of shock troops, schooled in the art of close combat warfare. They were agile and lightly equipped, enabling them to mobilise quickly and deploy swiftly when required. Their nimbleness was frequently used in surprise night attacks, where they gained their reputation for fierce and resourceful combat. The commando stiletto dagger was an essential part of their weaponry. A typical Commando Unit comprised; a Headquarters including Signal and Medical sections, five Fighting Troops, each of three officers, 62 Other Ranks and a Heavy Weapons Troop, normally equipped with two 3 inch mortars and two medium machine Guns. The total battle strength of a typical Commando Unit was approximately 400. On the 7th May 1938, two months after his 18th Birthday, Bernard Charles Sydney FENTON enlisted as a regular in the Royal Marines at Eastney Barracks, Portsmouth. They were trained for land and sea operations, infantrymen for the former and gunners for the latter. On completion of his initial training at Eastney, he served aboard HMS Belfast from August 1939 to December 1939; HMS Erebus from July 1940 to February 1941; HMS Nelson from April1941 to February 1942 and HMS Despatch from July 1942 to September 1943. In between postings, he married Celia Hepple in July 1940. A son, Bernard, was born in November, 1941 and a daughter, Maureen, followed in January, 1943. 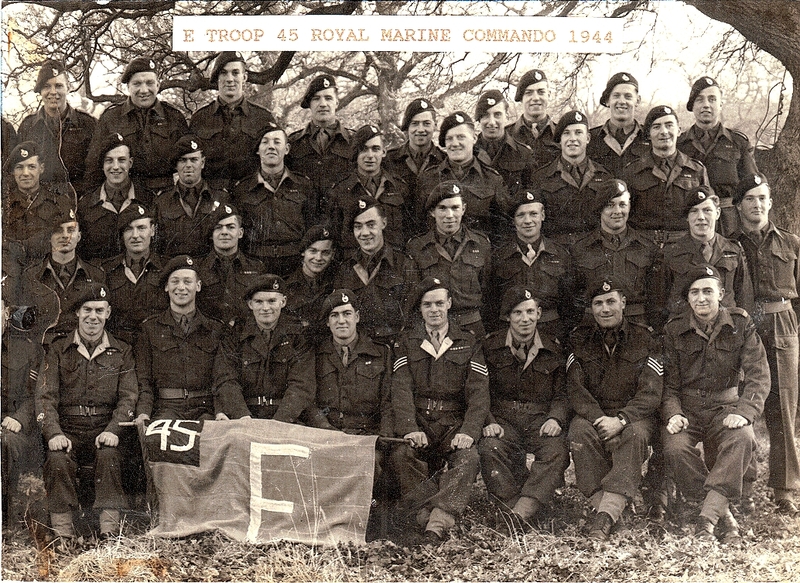 In November of 1943, Marine Fenton joined 45 Commando and embarked on their rigorous training programme. In the ensuing weeks, those struggling to keep up, were RTU'd - returned to their units. Most of the early training was undertaken in the rugged Argyllshire mountain terrain of the west of Scotland. In March 1944, 45 Commando moved to Eastbourne in Sussex, where techniques in amphibious landings and river crossings, using rubber boats, were perfected. 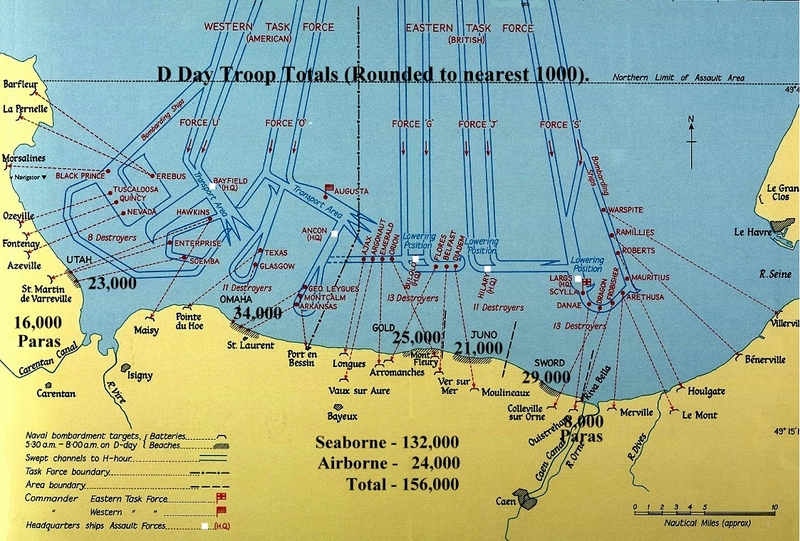 On the 26th May 1944, they left Eastbourne for a staging camp at Southampton, where they were regularly briefed for their task part in the greatest amphibious invasion in history; Operation Neptune, the amphibious phase, and Operation Overlord, the land assault on Hitler’s Fortress Europe. However, for security reasons there was no mention of their destination or timing of the invasion. 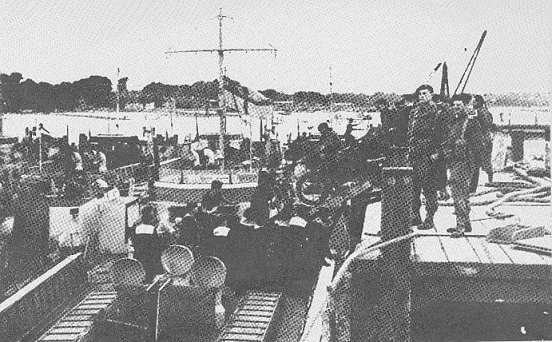 On 5th June, 1944, 45 Commando RM moved to Warsash at the entrance to the Solent where they embarked in five LCI(S)s, Landing Craft Infantry (Small). At 1700 hours, they slipped anchor and formed up in the Solent, to take their place in a vast armada of craft destined for the Normandy beaches. The voyage through the night proved uneventful, though the sea was rough. The secrecy over the Commandos' mission was finally broken, when the precise details of their landing beach were revealed; 0910 hours on "Queen Red" beach, two miles west of Ouistreham in Normandy. Their approach to the beach was under the cover of a very heavy bombardment of shells and rockets from Allied naval forces. One mile offshore, enemy shells fell around the long column of landing craft, many of which were ablaze. As 45’s flotilla approached the beach, enemy anti-tank guns opened fire from the flank. Two craft were hit and some casualties were sustained. On reaching the beach, a few troops managed ashore dry footed but the majority waded ashore, leaving the remainder facing the almost impossible task of swimming ashore carrying between 60 and 80 lbs on their backs. The beach area was exceedingly hazardous with mines, beach obstacles and rapid fire from flanking pillboxes, not to mention the activities of enemy mortar units and heavy guns. About a hundred yards inland, they passed through the line of the assault battalion (2nd Battalion East Yorks) as they made their way to their check point. Their advance progressed well, although harried intermittently by mortar and shell fire. Their first objective was to secure the bridges over the River Orne and the Caen Canal. It transpired that they were already in the hands of the Parachute Brigade, who had parachuted into the area seven hours earlier. The Commandos decided to use the bridges instead of the rubber boats they had carried but, during the crossing, the CO suffered injuries and was evacuated, while several others were wounded by snipers and a machine gun firing from upstream. The Brigade's objectives were to hold the high ground in the area of Hauger, Le Plein and Amfreville, providing support and protection for those holding the vital bridges over the River Orne and the canal, whilst safeguarding the invasion force’s left flank and to capture Franceville Plage and "infest" the coastal area eastwards towards Cabourg. 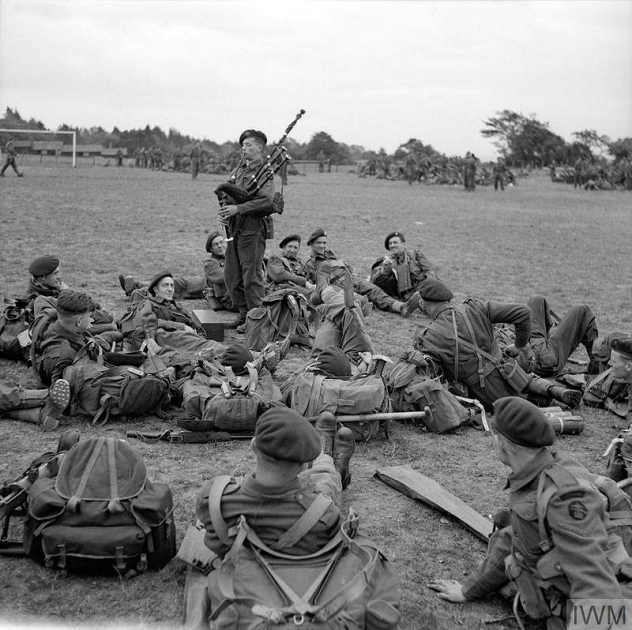 The task of 45 Commando, within the Brigade plan, was to capture the coastal battery of Merville, if this had not already been achieved by the 9th Battalion Parachute Regiment and then to capture Franceville Plage. The Brigade Commander ordered the unit to proceed independently to Merville to determine who controlled it. 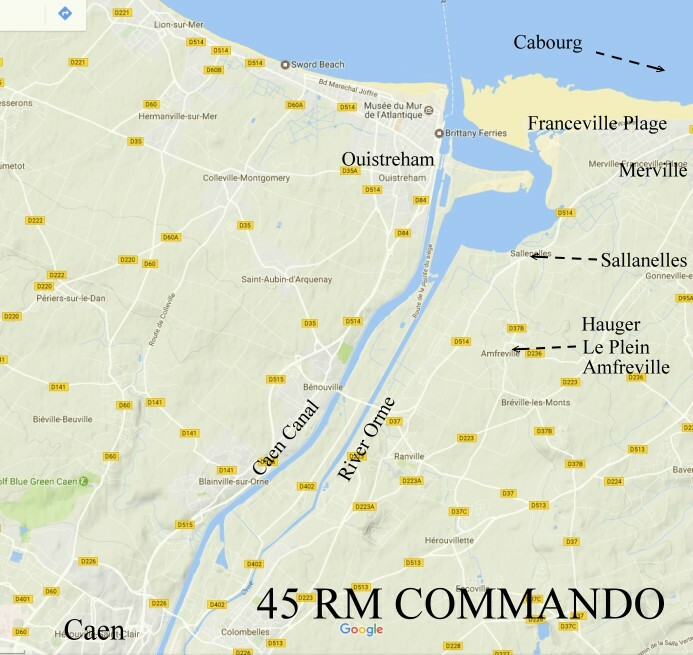 Meanwhile No 6 Commando, who had been first across the bridges, pushed their attack on the high ground at Le Plein, while No 3 Commando moved on the coastal area east of Franceville Plage. 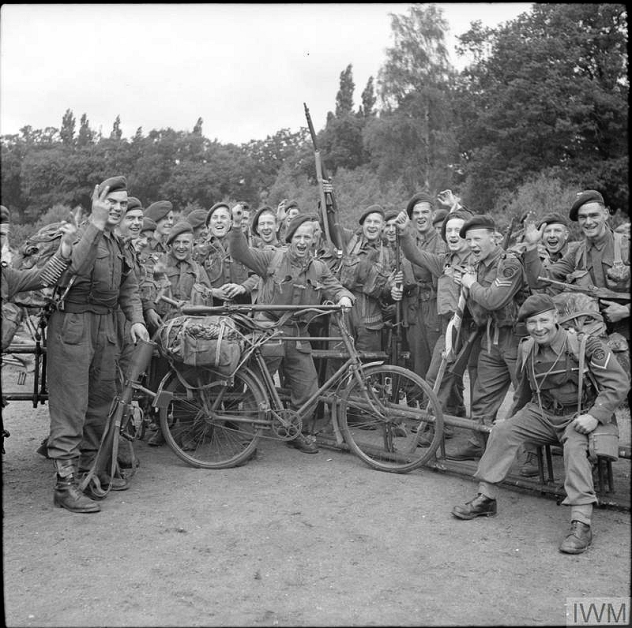 45 Commando moved off at a fast pace, with cycle Troop (C Troop), under the command of Major J N Rushforth, acting as advance guard. 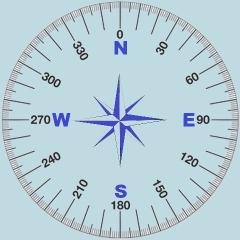 They were followed by ‘A’ Troop under Capt E E Grewcock, the Reconnaissance Group (C.O. and remaining Troop Commanders) and the rest of the unit. After passing through the village of Sallanelles, the two leading Troops turned off to the right but, owing to a sharp bend in the road, the manoeuvre was not seen by the following Reconnaissance Group. They continued along the main coast road until they saw some enemy troops running towards a strong point on the left, about 250 yards away. Fire was immediately opened by both sides and Marine G B Irvine (E Troop) hit his target at 200 yards range, firing from the standing position. Mne B Fenton was a member of C Troop. The enemy had the road well covered and kept the Reconnaissance Group and the leading section of ‘E’ Troop, pinned to the ground. Enemy mortars and machine guns swept the area, leaving the leading elements to painfully crawl back to the cover of nearby houses. The 3 inch Mortar Detachments (‘F’ Troop) were now ordered into action. They engaged the strong point and dropped some 30 mortar bombs in and around the enemy position. During this action, the unit withdrew slightly and continued its advance towards its original objective, the Merville battery. By then, they knew the battery had been silenced by the 9th Battalion Parachute Regiment earlier that morning. However, the leading Troop was fired on by the enemy, who had returned in strength to this heavily defended position. During the reconnaissance, prior to launching an attack on the battery, the unit was ordered to hold Merville for the night and not to advance on the Franceville Plage. The battery was therefore by-passed, Merville village cleared and an all-round defensive position taken up by 19.00 hours. The village had been badly damaged by RAF bombing and all the civilians had disappeared. However, the demolished buildings made good cover and the unit quickly dug in for the night. Commando Headquarters was established in two broken-down cottages, which had a thick-walled garden. Longing eyes saw a large undamaged farm house but it was decided to sacrifice comfort for safety. It was a sound decision since the farm was later demolished and set on fire by an enemy self-propelled gun. With defences in good order, tea was brewed, providing the Commandos with their first and very welcome hot drink since landing. Just before dusk they were greatly heartened by the sight of the 6th Air-landing Brigade being towed to the bridgehead in their gliders. So ended the first day. Apart from the short clash outside Sallanelles, there had been little close contact with the enemy but there were some casualties: Lt W Kennedy and three other ranks were killed; Lt-Colonel N Ries, Lt P Nelson and 14 other ranks were wounded and Lt P Winston and 20 other ranks were missing. The Commando had a quiet night, although the beach area to the west, had been heavily bombed. At 03.00 hours, orders were received to move back to the Brigade’s defensive position in the area of Le Plein. By 04.00 hours, the unit was on the move and just as they left the village, enemy patrols were entering it from the other end. It was a three mile trek back to Le Plein, which was accomplished in the half light, without incident. The silence was punctuated by the muted curses of the unfortunate Cycle Troop who struggled manfully with their steeds, up and down immense bomb craters, so liberally supplied by the RAF. On passing through the deserted main street of Sallanelles, some witnessed the astonishing sight of Major Rushforth, the leading Troop Commander, looking most warlike and poking his rifle into a window, while yelling: "Come out! I’ve got you covered." An aged Madame, with hair in curling papers and looking equally warlike, peered from the next window exclaiming "Ah, ‘ces Anglais!" The unit eventually reached a valley sloping away from the coast road and dug in under some apple trees to the left of the Brigade’s position. This was adjacent to No. 4 Commando, who had returned from Ouistreham, having suffered heavy casualties in capturing the battery there. Later that morning, accurate enemy mortar fire, from a strong point at Sallenelles, homed in. The Commando's 3 inch mortars returned fire, but were quickly spotted by the enemy and duly "stonked". The position sustained direct hits, causing two casualties, so the mortar detachment made a very rapid move to alternative positions. Fully laden Jeeps, which were last seen at Eastbourne (such a very long time ago, it seemed), now began to arrive. Much needed ammunition, signal stores, medical supplies and weapons were quickly unloaded and the jeeps sent back with the wounded. About this time, a 'warning order' was received preparing the Commando to attack Franceville Plage. An Order Group quickly assembled and issued appropriate orders for action, greatly assisted by knowledge gained from models and aerial photographs of the town during briefings, prior to embarkation. The attack had been rehearsed many times while the Commando was in Eastbourne, so each man knew the overall plan and his part in it. Two Troops of No 3 Commando, were in support of the mission by engaging with the enemy hold up in the Merville battery. In addition, one six-pounder anti-tank gun, with the Brigade’s MMGs, covered the advance through Sallanelles. Two Royal Artillery Officers from their Forward Observation Base (FOB), who directed Naval supporting guns by radio, were attached to call on naval shell bombardment if needed. Half way through the CO’s orders, the Order Group came under mortar fire and took refuge in a ditch, from where orders continued to be issued between explosions. Mortaring and shelling of the Commandos continued with increasing intensity and accuracy, as they moved along the road and through Sallenelles. The advanced party lost their 3inch mortar barrels and the men carrying them. A jeep carrying ammunition, also received a direct hit and, taken together, these losses proved to be a serious handicap. Brigade HQ was contacted for replacements but the advancing party could not wait for them to be delivered. It later proved to be impossible for them to get through. 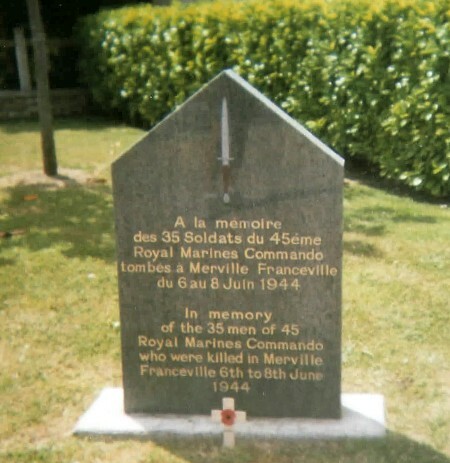 At about 16.00 hours, the Commando came under fire from the Merville battery. One Troop engaged with it, while the remainder passed on to Merville itself. Final orders for the attack were given here and, while the Commandos formed up, their objective was bombarded by two cruisers and two destroyers, which were on call to the FOB. Franceville Plage was a small coastal resort, consisting mainly of detached villas and divided in two by a long straight road, which, for the purposes of the operation, was code named Piccadilly. The plan was to advance along Piccadilly; E Troop on the left and B Troop on the right. C Troop was to clear some enemy posts to the west and also to give left flank protection; A & D Troops were to follow E & B and would eventually pass through them, when they reached the sea, to take some enemy positions to the east. At 17.05 hours, the attack started. The distance between Merville and the outskirts of Franceville was about five hundred yards across flat open country. C and E Troops advanced simultaneously, followed by B with A Troop prepared to give covering fire. The edge of the town was reached and cleared without any fire being drawn from the enemy. C Troop, swinging left, cleared the wood to the west of the town and took up a position on the left flank with the object of providing protection to the main assault. The wood was full of slit trenches and dugouts and these were quickly cleared using grenades. The sound of firing from the direction of the Merville battery, indicated that the two Troops of No 3 Commando were in action. Owing to casualties in wireless sets and signallers, there was no communication with them or with Brigade HQ. This resulted in Captain Hodgkin of the FOB, attached to 3 Commando, becoming detached from his unit. Since communications with 45's own FOB had been lost, Captain Hodgkin was ordered to remain. Meanwhile E & B Troops, followed by D & A, moved up Piccadilly with little opposition. The two forward Troops reached the main strong point at the northern end of Piccadilly, where they came under heavy mortar fire. They took up positions in the houses facing the strong point. In a gallant attempt to smash the strong point, ‘E’ Troop Piat Group, L/Cpl Davis, Marines Lee and Lowe, led by Captain Beadle, made their way forward, hoping to get a Piat bomb through the pillbox slits. They fired one bomb, which fell short and, before they could correct their aim, they came under heavy fire. L/Cpl Davis was killed and Marine Lowe wounded. 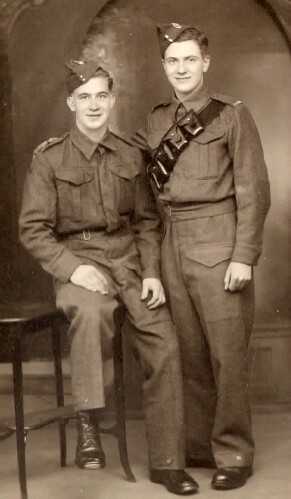 Captain Beadle and Marine Lee managed to recover the Piat and help the wounded man to relative safety. Having temporarily lost radio contact with C Troop, the CO visited the left flank to make contact with them. He decided to move forward but, before he had moved fifty yards down Piccadilly, an anti-tank gun, firing from a pillbox at the end of the street, scored a direct hit on the patrol. RSM John Henry Grimsey (photo opposite) and Cpl Watson were killed and two others wounded. A & D Troops now began to advance on either side of Piccadilly. As A Troop reached the bottom of the street, they met with heavy fire from some houses to the East. They immediately fanned out and, by "leap-frogging" from house to house, eventually drove the enemy from their post near the beach. It was decided to hold the existing Commando position. Private Arnold of No.10 (Inter-Allied) Commando, approached the enemy with a white flag, telling them to surrender as we had three divisions behind us and it was useless to fight on. The only answer to this appeal was a heavy burst of machine gun fire followed by even heavier mortar fire. At the same time, the enemy put in a strong counter-attack to the right rear. After some close fighting, with heavy casualties on both sides, it became obvious that the enemy was much stronger than had been expected and that they were trying to cut off our advance and to push us onto their beach defences. The CO decided to fight out from the beach area and to take up a position on the Southern side of Franceville. During the withdrawal, hard and confused fighting took place at close quarters. The enemy knew the ground well and seemed to appear from all sides at once. It became difficult to distinguish friend from foe, as fleeting figures slipped from shadow to shadow and as rifle shots came from the flanks. The CO, now with A Troop, had taken up a position on a sandy knoll on the outskirts of Franceville, which dominated the surrounding area. Here the unit gathered, while patrols were sent out to bring in stragglers and wounded. The enemy, who was, by then, working around to the rear, began to close in on the knoll. Fortunately radio contact with C Troop was restored - they were still on their own protecting the left flank. C Troop were now ordered to counter-attack the enemy to the rear and also to clear the right flank. Led by Major Rushforth, C Troop put in a most gallant and dashing attack. After fifteen minutes of intense fighting, they captured a large school building which dominated the area and thus freed the Commando’s rear. During this attack Major Rushforth was wounded leading the assault and Lieutenant Jackson took over command of C Troop. A defensive position was quickly organised just in time to meet a strong counter-attack by an enemy most determined to finish off the Troop. However, C Troop’s courage and tenacity and the dominating position which they held, enabled them to beat off these attacks and the Commando was saved for the time being. For his courage and leadership in leading the counter-attack Major Rushforth was later awarded the M.C. Sergeant Stuart and Corporal Harrison both received the M.M. for their gallantry and leadership during the attack and in beating off the counter-attack. It was now 23.00 hours, darkness had fallen and ammunition supplies were very low. The CO decided to return to Merville. B & E Troops were given orders to move to Merville as quickly as possible and to re-occupy their old positions. The rest of the unit would follow on, carrying as many of the wounded as could be safely moved. It was decided to leave the very badly wounded men behind. Two Medical Orderlies, Cpl. Relf (himself slightly wounded) and Cpl Dunlop of the Royal Army Medical Corps, volunteered to remain behind to safeguard the wounded. Both were later reported as prisoners of war. This spirit was typical of the RAMC personnel. Their work with the Commando was always magnificent and beyond praise. Throughout the confused street fighting in Franceville the Medical Orderlies, led by Captain Smith and Sgt Curren, had worked wonders in tending the wounded under fire and bringing them into cover. Captain Smith later received the MC for his gallantry during this action. By 23.45 hours, the Commando had taken up a tight all-round position in Merville, occupying almost the same positions as the previous night. There were traces of the enemy in most places but the speedy arrival of B & E Troops caused them to move quickly in the opposite direction. C Troop were delighted to find a few Germans digging their old trenches even deeper, so they allowed them to continue, but this time for C Troops benefit. A Troop, on the other hand, had a short scrap for their former homes. So ended the second day. The Commando were now well and truly blooded. Mistakes had been made and lessons learned. There had been periods of great danger but thanks to the courage and determination of all ranks and the timely counter-attack by C Troop the job was done. Casualties during the day were... killed - Lt. Gale and fifteen other ranks; wounded - one officer and thirty-eight other ranks (several other officers and men were slightly wounded but remained with the unit); missing - Lt Dunkerley and twenty-three other ranks (most of whom were wounded and later reported as Prisoners of War). The night passed comparatively quietly, probably because both sides were feeling exhausted. Just after dawn, Sgt Hemmings returned from Brigade HQ bringing with him relief signallers and spare wireless sets. His outward trip had been quite lively. Soon after leaving friendly lines, he made contact with six men from D Troop, who had been cut off at Franceville and were trying to return to their unit. He took them under his wing and continued on towards the Brigade lines. About half a mile further on, the patrol walked into a German position. In the ensuing melee, all except Sgt Hemmings and Mne Crouch, were taken prisoner. Hemmings and Crouch later reached Divisional HQ. As the light improved, small enemy patrols began probing the Commando defences and the activities of snipers became irritating. At 08.30 hours, a signal was received from Brigade saying that an attack was expected that day and that 'Merville must be held at all costs.' We learnt later that a German prisoner had obligingly informed the Brigadier that on the 8th June the English would be driven into the sea. An Order Group was called and everything possible was done to tighten up our defences. Ammunition was by now very limited and the HQ personnel shared their allocation amongst the troops. By 09.00 hours, both enemy patrols and sniping had increased and movement was reduced to an absolute minimum, while counter sniping parties were organised. These achieved some success, in particular Cpl Emuss of E Troop and Cpl Bartholomew of C Troop. At 09.30 hours, the Commando was heavily mortared, HQ, A and C Troops getting most of it. This was quickly followed by an attack from the direction of the Merville battery. A & C Troops bore the brunt of the attack, which was broken up by close range small arms fire with few casualties. After this, spasmodic mortaring and the intense sniping by the enemy bore down on Allied positions. During this last attack Mne B Fenton suffered a head wound and he became a casualty. At about 10.15 hours, two Renault Ambulances drove unto Melville, manned by rather confused German drivers, who had no idea that the town was occupied by British troops. The ambulances were used to transport eight stretcher cases in need of urgent medical attention back to the Brigade lines. However, there were risks of being captured by the enemy but it was hoped that should this happen medical treatment would be provided. L/Cpl Saunders, an interpreter with 10 (Inter-Allied) Commando, who was slightly wounded in the leg, volunteered to conduct the party. The eight casualties and a badly wounded German prisoner were loaded into the ambulances under cover of a Red Cross flag. There is no doubt that, on this occasion, the enemy respected the flag, as the loading was completed without interference. The ambulances drove off in the direction of Le Plein but they were recaptured fairly soon after leaving Merville. 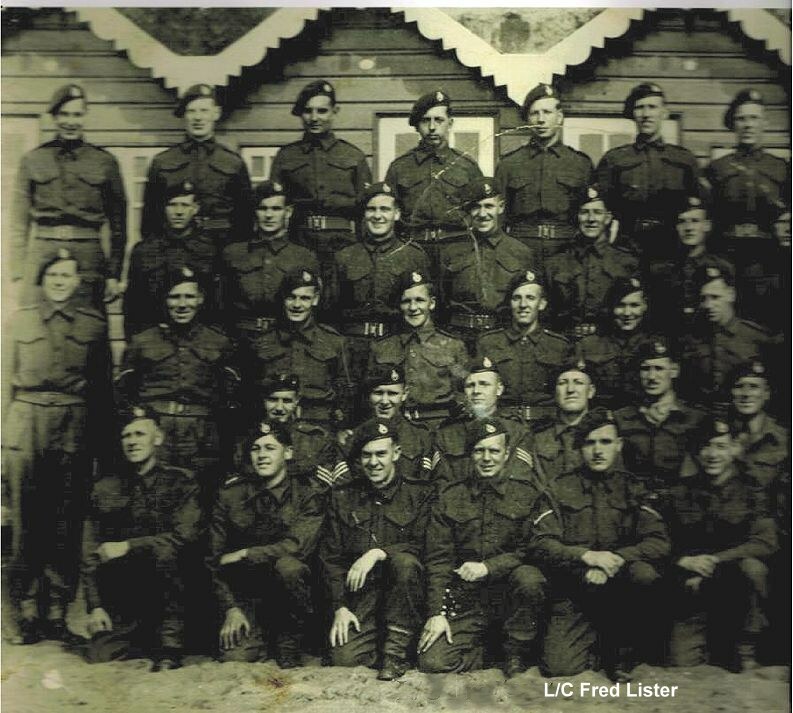 L/Cpl Saunders, who escaped and rejoined his unit 24 hours later, confirmed that the wounded were immediately despatched to a German Field Hospital. Those POWs, who returned home at the end of hostilities, confirmed that they had been well treated. Marine B Fenton was one of the stretcher cases. He was taken to a German Field Hospital at the Chateau at Pont L’Eveque. It was there on the 13th June 1944 that he died from his injuries. The names of all who served in 45 Royal Marine Commando and who were killed in action or died during the war. Lance-Corporal H. E. Harden, V.C. My name is Andrew Renton PERCIVAL, born in Glasgow and now retired in France. My uncle, L/Cpl Andrew Renton PERCIVAL, EX/4169, was killed on 7 June 1944 and is buried in the Tilly sur Suilles cemetery. I have a book by Julian Thompson, 'The Royal Marines from Sea Soldiers to a Special Force' which includes the D-Day landings as well as personal accounts. Page 328 covers a witness report by Marine Walker of D Troop on 7 June 1944. "We went into the first house to attack from the back gardens. Lt Gale and seven others got over to the second house. I was one of them when we came under heavy fire. I am sorry to say only I and Mne Murray escaped by crawling round the back porch of the house. Lt Gale, Sgt Nutter and all the others were killed. Ted Murrey and I got back to the rest of the section. We decided that we would go and attack from the front of the house, we came under fire again and more were killed or wounded". Sgt Nutter is buried next to my uncle at Tilly-sur-Seulles cemetery. Lt Gale is also buried there on the last row behind Sgt Nutter and L Cpl Percival. Next to Lt Gale there are others including Sgt Major J H Grimsey. I have visited this and other cemeteries on a number of occasions and on completion of the last visit asked the War Graves department if I could pay for a bench to be placed there, as I and others, are not as mobile as we once were! This request was refused. During my last visit 2 years ago, I visited Merville and Franceville. I have attached a photo of the memorial stone to the 45 RMC as well as one of my uncle L/Cpl AR Percival (left) and his friend Marine Russell Mitchell (right), who was also killed. 45 RM Commando. This, and other photos I've seen of 45 RM Commando, show what appears to be half a troop with only forty or so in the picture. I wonder if they are officers and NCOs only. 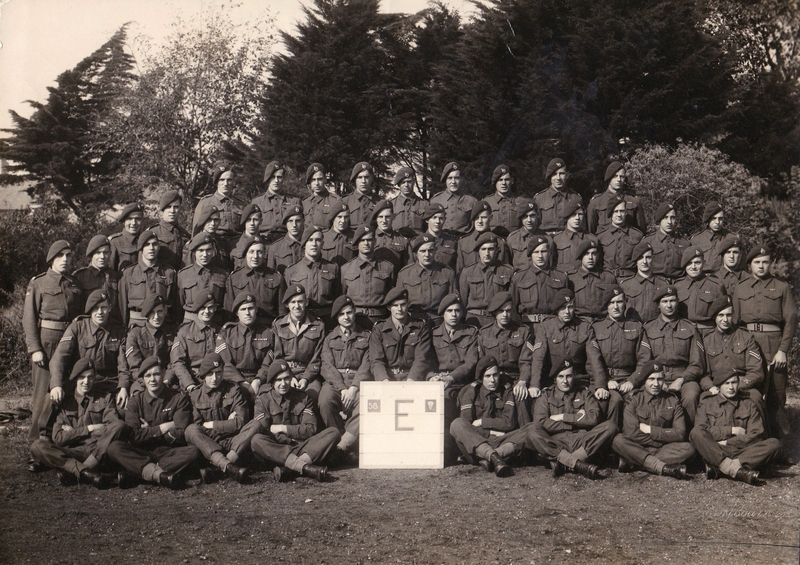 45 RMC was, at the outset, 450 men strong, so each troop would amount to about 90. My Father, Francis Gerard Burton, MM, was a radio operator. He left for Normandy from Warsash in a landing craft and when the ramp was lowered at Red Queen the first two to disembark were killed. My dad was next in line. RM Commando Vehicles. I'm currently marking up a 1943 Jeep in 48 RM Commando unit markings along with Captain Martyn Heenan who is restoring a James ML motorbike. I wonder if anyone knows what markings were used on RM Commando vehicles involved in the D-Day landing s - Combined Operations insignia or the Commando dagger? ... and did the markings change later in the war? We know the dagger was used post war, but we have also read that only HQ vehicles used the Combined Ops badge. Any opinions or sources of information we could consult would be very much appreciated. Cheers, Sean. William George Norton. My name is Tony Norton. My father, William George Norton served in 45 royal marine commando but rarely talked about his war experiences and was unwilling to record his wartime experiences. Sadly he passed away in May 2010 and since then I've been trying to find out more about his time in the Commandos. I'd be very grateful to receive any information or photos about his service, or sources of information I could try, as I'm very proud of him and would like to know more about his contribution in WW2. This would help me understand what made my father the man he was. The information I've gleaned so far from various sources may help you identify him. I know he enlisted at Chatham on 30 Sept 1941 as a Marine and gave his date of birth as 7th May 1924, which was a false DOB as he was under-age. His division and register number is CHX105546. He said he was in A Troop 45 Commando. We know he served in the Italian campaign in 1943 and possibly 1944, but when asked about D Day merely said he was held in reserve. I have since read in books and on the internet that A Troop 45 Commando landed on D Day although we cannot identify him in any pictures so far. The book Forgotten Voices of D Day, includes a passage by Marine Edward (Tommy) Treacher who describes how 45 Commando waited on the quayside for the go sign. My Dad frequently spoke of Tommy Treacher and we believe he was a close friend in the Commandos. Dad often spoke of the Special Service Brigade but never spoke of D Day or being in France; this is a puzzle to me. He also spoke of being in Holland and crossing several rivers in Germany. My father told me about a battle in Holland where he witnessed the actions of Lance Corporal Harden which won him his VC for bravery. We have my father's medals and certificate of service and he’s entitled to the 39-45 Star, Italy Star, France & Germany Star and War Medal. We also know he re-enlisted at Deal on 13 September 1950, service number RM10266 and served until 13 January 1953 when he was discharged as being below the Royal Marine Physical Standard. He sailed on HMS Curacoa, but was not on-board when she was sunk. I hope this information helps trigger some connection with my father although some of it is more speculation than substantiated fact. Thank you in advance for your time and help in this matter. 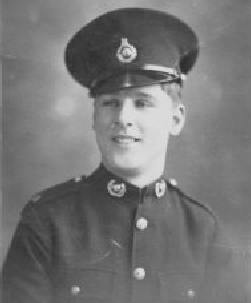 Fred Lister, 45 Royal Marine Commando. I'm seeking information on my father and the part he played with 45 Royal Marine Commando. I only have limited knowledge but believe he was with A Troop. He was from Burnley, Lancashire. 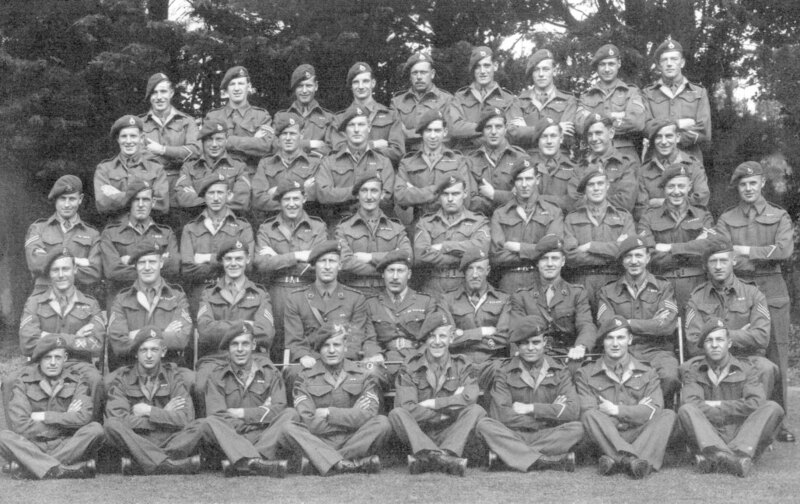 I know he landed on Sword Beach on D-Day but all I have is a small photograph which shows only a small portion of his unit/regiment (as the photo has been torn in half) taken prior to June 6th and on the reverse is printed the name of the photographer and "Shanklin" which I believe is on the Isle Of Wight. On this page, in the picture above right, is a group from A Troop taken prior to embarkation in Southampton, with Lance Corporal H E Harden, VC, in the right foreground. What interests me about this picture is that some of the men are on the photograph I have, which means they must have known my father and maybe he is on there in the background somewhere. My dad is on the front row of my photo and was a L/Cpl at the time. I don't know much else really but my sister thinks my dad may have been a Medic. We do know he ended up in hospital with shrapnel wounds and finished his service as a sergeant. If anyone could help me with further information or point me in the right direction I would be entirely grateful. I'd like to trace his steps during 44/45 as well as put a few names to the photo I have. Many Thanks, John Lister, Burnley. 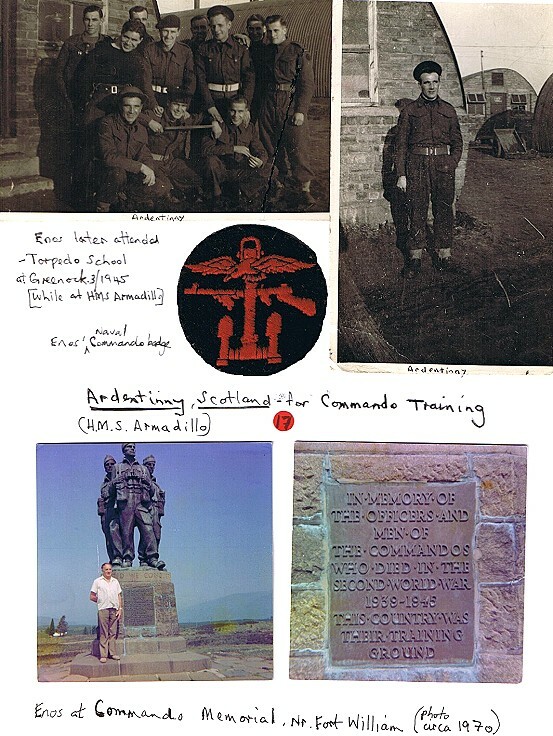 This account of 45 Royal Marine Commando draws heavily on the official publication 'The Story of 45 Royal Marine Commando' written by the 45's officers and published privately for members of the unit and their relatives. The book covers the history of the unit from its formation in August 1943 until it returned from Germany in June 1945. Intermingled with this account, is the story of Marine Bernard Charles Sydney Fenton provided by his son Bernard. 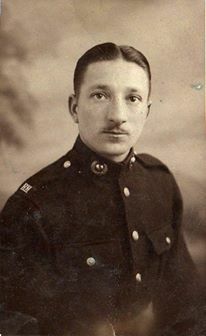 Marine Fenton joined 45 Commando late in 1943. Along with his comrades in arms he was involved in the D-Day Landings.